The National Union of Healthcare Workers further cemented itself as the union of choice for mental health clinicians Thursday with an overwhelming organizing victory at Richmond Area Multi-Services, Inc.
Employees at the San Francisco-based mental health nonprofit voted 77-3 to join NUHW. 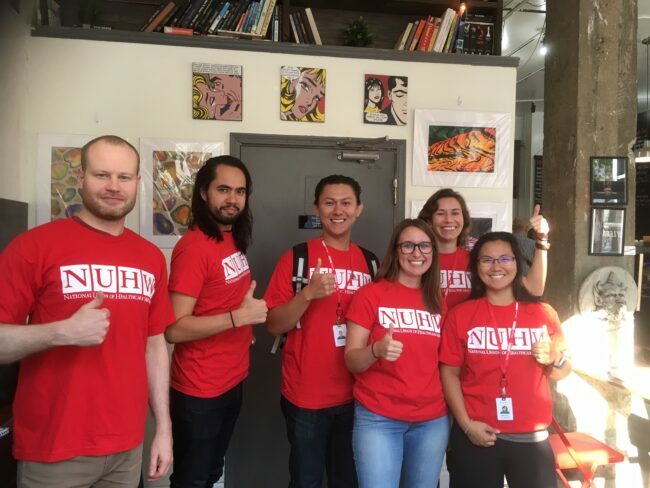 After bargaining a contract that bolstered staffing and delivered significant raises for mental health clinicians at Kaiser Permanente, NUHW has won organizing elections over the past year for mental health workers at UCSF Benioff Children’s Hospital Oakland and Janus of Santa Cruz, a drug rehabilitation center. Last month, four NUHW-represented clinicians from Kaiser Permanente and Children’s Hospital Oakland traveled to Washington, D.C., where they urged Democratic and Republican lawmakers to take bold action on the opioid addiction crisis and step up enforcement of laws guaranteeing Americans timely access to mental health care treatment. At RAMS, a nonprofit that operates in San Francisco schools and serves community members, the union will represent psychologists, therapists, behavioral health counselors, employment consultants and clinical supervisors. Earlier this year, members of the San Francisco Board of Supervisors sent the nonprofit a letter asking managers to remain neutral in the organizing campaign, and the nonprofit obliged. “We are thrilled to represent caregivers at RAMS and look forward to productive bargaining sessions that result in a fair contract that benefits workers and patients alike,” Rosselli said.